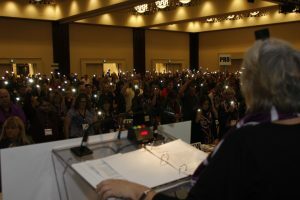 Delegates observe a moment of silence and shining their phone lights to commemorate lives lost, and pledge to work against gender-based violence. As a gesture of support for survivors of violence against women, delegates at OFL’s final day of convention wore purple as a sign of courage. Lights were dimmed and delegates shone their phone lights which flickered like candles throughout the hall. Fourteen female engineering students were gunned down at l’École Polytechnique de Montreal on December 6, 1989. Canada’s Parliament later declared December 6th the National Day of Remembrance & Action on Violence Against Women.